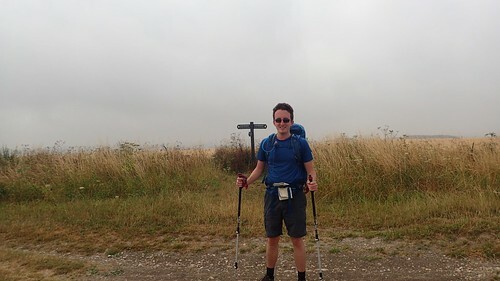 If not for the help and suggestions of my friends Matt and Joe, I believe I would’ve struggled to complete this second stage of my Ridgeway walk; trekking for two days across one weekend. We all left Bristol in the one car and my friends had kindly offered to drop me off at one point on Saturday morning and then to collect me on Sunday afternoon and return me to Bristol. Meanwhile, they were off on their own getaway walking a good stretch of the Thames Path. My day’s walking would begin at the National Trust car park for White Horse Hill near Uffington. I would’ve been happy enough if they’d have let me out of the car at the campsite I used further down the slope but, for a little help in gaining elevation to rejoin the trail, I wasn’t going to complain. 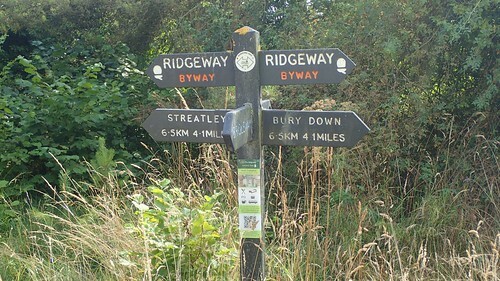 Finding my way back up and on to The Ridgeway was simple, with a number of routes I could’ve chosen from. 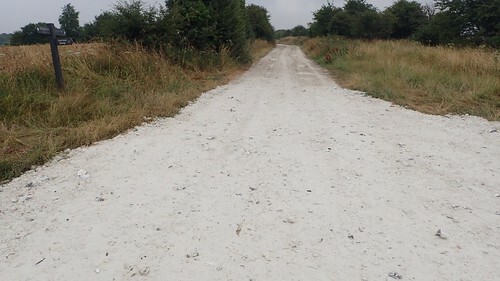 I decided to stray from the direct route of the road, knowing I was likely to be walking along hard, dry chalk for much of the day. This was where I discovered the toposcope you can see above. 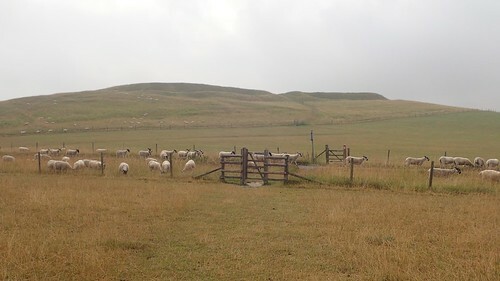 Continuing in a vertical direction, I would follow the south-eastern ramparts of Uffington Castle hillfort in order to rejoin the UK’s oldest bridleway. This was where I took my first and only selfie of the weekend, using a fence post to support my camera. If the ground wasn’t so hard, I could’ve driven my walking pole in and used that. I’d also packed my mini tripod but couldn’t be bothered to take my pack off so soon. 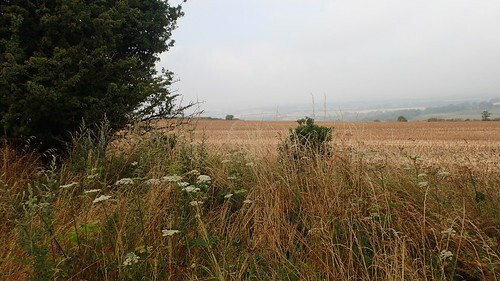 I soon met up with the exact point from which I had previously left The Ridgeway, where a path heads off down the hill towards Britchcombe Farm. Immediately after this, the condition of the surface improves dramatically. 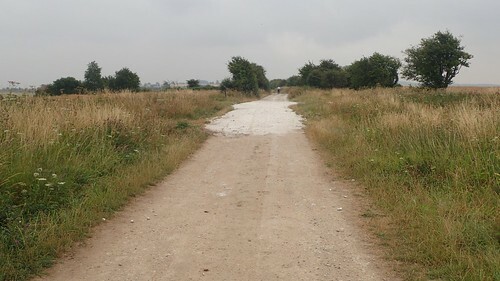 While still bone dry and hard underfoot, the path is level to the extent where I wondered if it had recently been renewed. 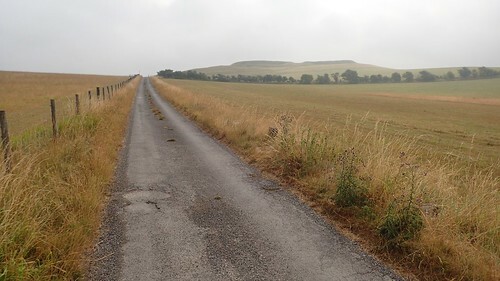 Spoiler alert: much of the first forty-miles of The Ridgeway involves following a dry chalk path that’s frequently rutted by four-wheeled traffic, interspersed with the occasional tarmac road. You get used to it, very quickly! I’d read in my guide book that there are alternative paths available for walkers, running parallel and close to the actual route. I took one look behind this hedge and decided to stick to the wider path. 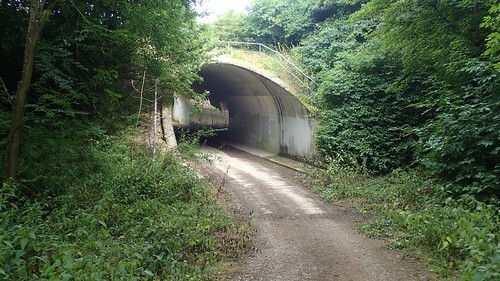 Walking on, I noticed that the alternative route soon disappeared deep in to the undergrowth. 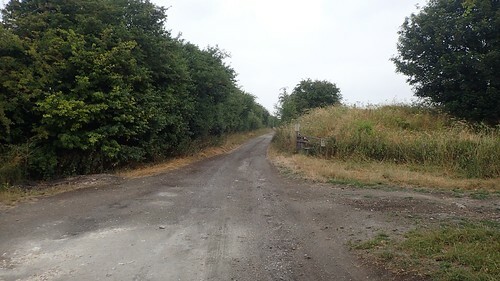 Although this is a public byway, much of the route is closed to motor vehicles during the winter months, in order to preserve the route from excessive erosion. A couple of miles in and, just ahead of Sparsholt Firs, I spied what could’ve been my first trig point of the day, just north of the trail. 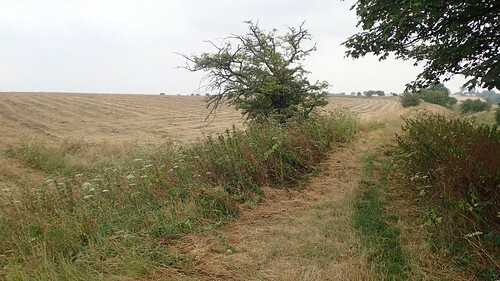 But, there’s no right of way leading across this field and, as you can clearly see, I would’ve had to fight my way through whatever was growing beyond the boundary. 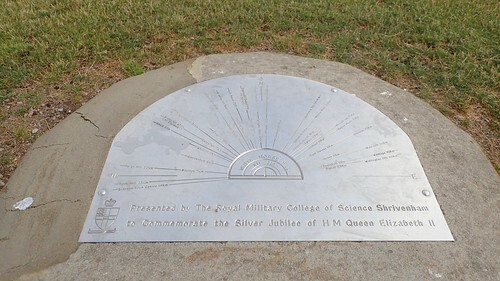 At least, others have visited and recorded its status. It was also around here that I took advantage of the water tap at Hill Barn. I can only assume this one is available year-round, unlike the ‘summer only’ option further west at Idstone Barn. 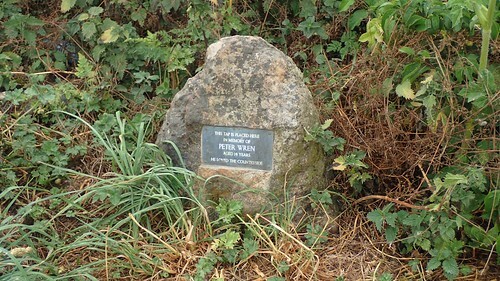 This particular tap was placed here in memory of Peter Wren, who I’ve read died nearby at the age of fourteen. I hope he didn’t die on the trail. But what a great way in which to remember someone and support others. 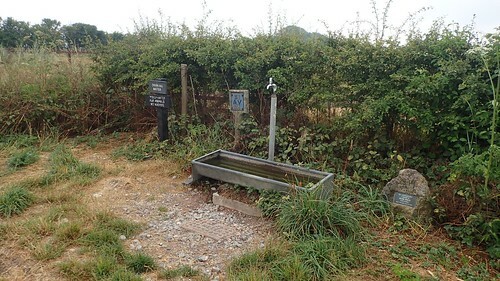 I’d love to see more benches along The Ridgeway but this was unique to me. There isn’t much I could tell you about the views from this morning, despite being just over two-hundred metres above sea level for most of it. Low cloud and mist had taken over. A blessing, in many ways, as the temperatures would otherwise have risen in to the mid-twenties, if not higher. Closer to Letcombe Bassett, the path before me suddenly transformed in to snow-white chalk. 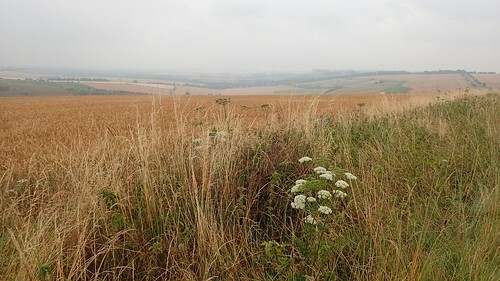 I’d planned to have my first stop of the day soon after this, at a hillfort known as Segsbury Camp or Letcombe Castle. 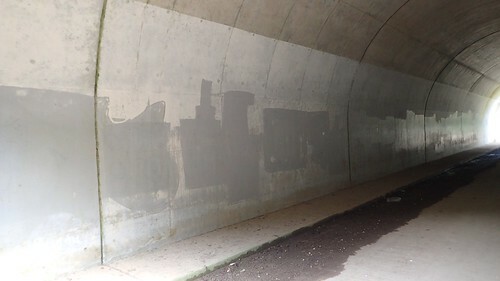 Although my photos don’t demonstrate this clearly, this mad-made feature has been driven in to two unequal halves by a road running north from Segsbury Farm. 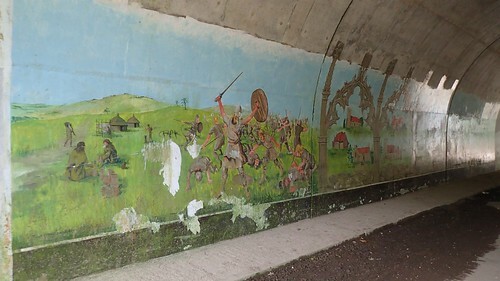 I can think of several other hillforts around Westcountry that I have previously visited and not one of them has been ‘mistreated’ like this. 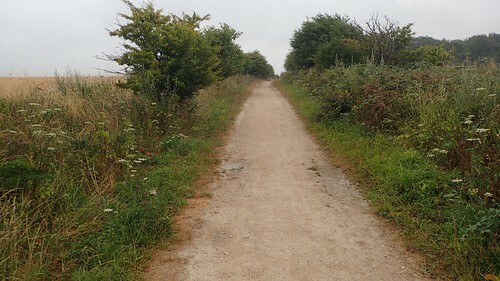 Neither half is classed as open access land, although a permissive footpath follows the raised perimeter above the surrounding ditch and, again, bisected by the road. I did pause to take in the views looking north but didn’t feel comfortable enough to stop for long, with so many bugs around. Several busy road crossing would be a feature of this day. After ‘breaking myself’ with 18kg+ on my shoulders in June, I had reduced my pack load to less than 13kg, even with 2lt of water. This was largely because I was booked in to a youth hostel for Saturday night and wouldn’t need any of my camping or cooking gear. As I was only walking for two days, I was able to restrain myself from packing too much clothing and food. This all went in to my Lowe Alpine Airzone Trek+ 35:45 rucksack without having to use the additional 10lt of capacity. 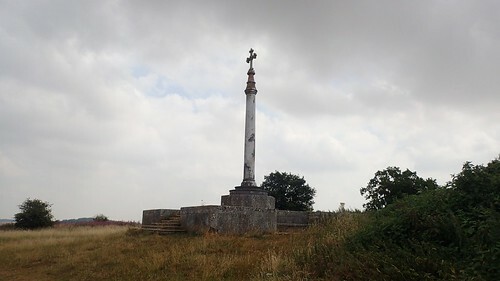 Overtaking the two people you may’ve seen above, at the next road crossing, I’d soon arrive at what is known as the Lord Wantage Monument. 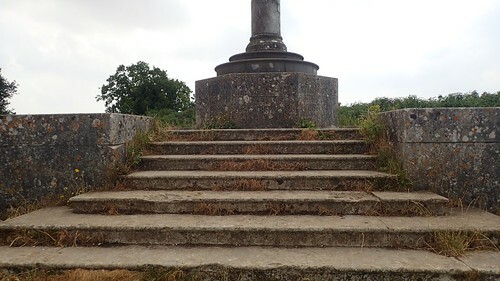 I managed to film a number of sections of this walk and will put it in to a YouTube video in time… All I’ll say is that my walk up to this monument is worth watching out for!! East of here and north of the trail, ‘Ridgeway Reservoir’ is clearly stated on both the Harvey’s and Ordnance Survey maps. 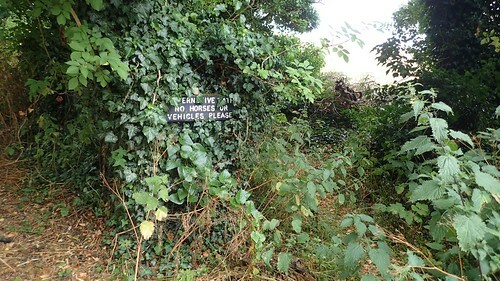 But it exists under the cover of trees, beyond a boundary wall and with ‘private’ signs dotted around. Before the next road crossing, I would reach Scutchamer Knob. While the name may amuse many, I was most excited by the fact that this was the halfway point in my day. 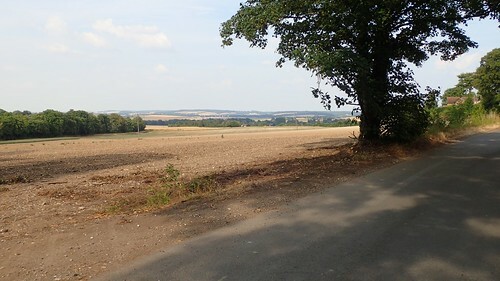 But I sped through all too quickly; bypassing the Knob itself and any lost memory of finding the nearby trig point (looks like it would’ve been an easy one to bag). I may have to revisit this one. By now, the middle of the day had passed along with the mist and cloud that had concealed the sun. 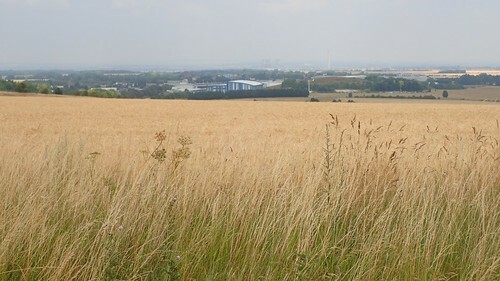 Temperatures began to rise, as the Harwell Science and Innovation Campus came in to view. Well, that wasn’t at all likely! 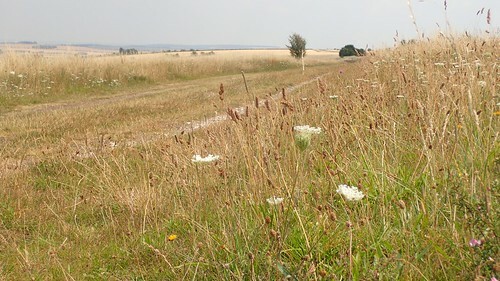 So, in between Cow Down and Chilton Downs, I plonked myself down on the path and tucked in to my sandwiches. As I would be staying in a hostel, I was confident that I could ‘save’ Sunday’s lunch in the fridge overnight. Although, I maintained my rule of not carrying chocolate on this trail. Pressing on with the walk, I felt a tickling sensation down my arms, around my face and I then noticed that my legs were also covered with hundreds of this tiny tickling insects! Flying ant larvae? Had I sat down on a nest?! I kept smearing them from my skin as I walked on; probably removing sun cream in the process. After passing the next group of people (who were apparently bug-free, I applied insect repellent to every patch of exposed skin… Whatever these pests were (and they weren’t biting me), they were apparently immune to the stuff! Over another road with another car park and I would soon descend to pass under the noisy A34, which runs north past Didcot in Oxfordshire and then south, over the M4 and past Newbury in Berkshire. 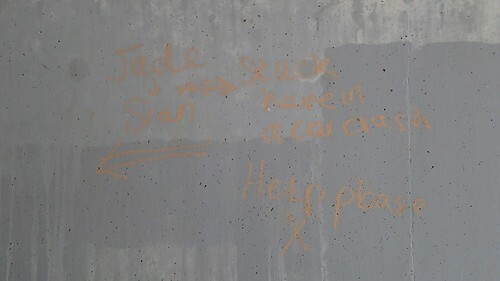 I wasn’t expecting anything more than the usual graffiti – which appeared to have been painted over. 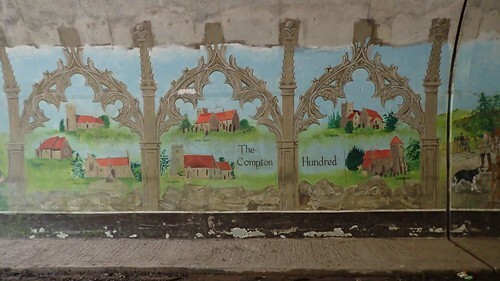 This impressive artwork along the southern wall refers to The Compton Hundred and portrays a glimpse of the local area’s history. 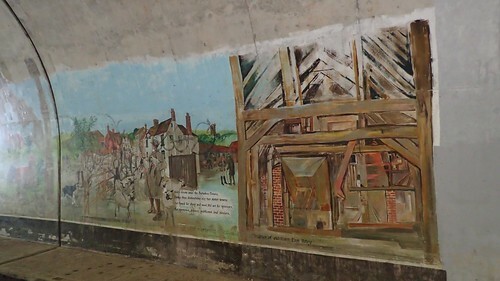 A memorial to Hugh Frederick Grosvenor can be found just beyond the underpass. While the lieutenant died close by, his body was laid to rest many miles north at a churchyard in Cheshire. Another couple of hours and I would probably reach the youth hostel. It was incredibly humid with no offer of shelter or respite and those tiny flies I mentioned were continually drawn to my heated skin. 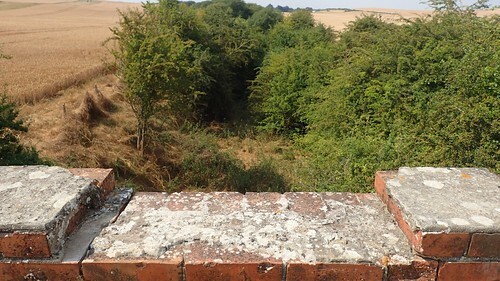 Just as I’d suspected, I can now confirm that I did cross over a dismantled railway near Blewbury Down. 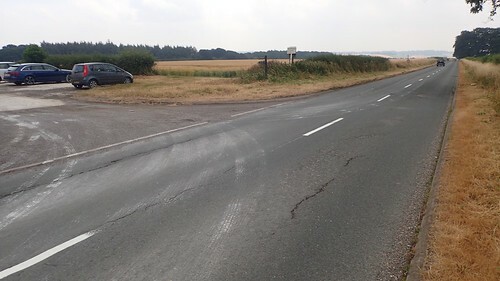 I always find it a little sad to see this, as our roads and motorways are becoming increasingly congested and, sooner or later, it seems inevitable to me that we’ll need to bring these forgotten lines back to life in order to survive. 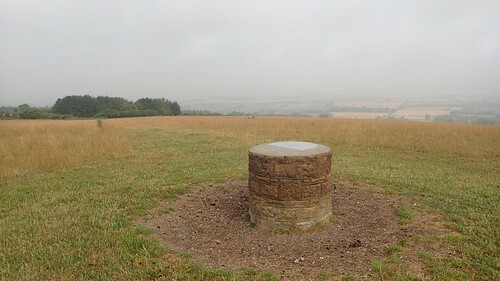 From Roden Downs, I took a detour from The Ridgeway of a few hundred metres, in the hope of bagging what could’ve been my third trig point of the day. My Harvey’s map shows a “path” leading straight to it… Which was where I encountered this locked gate. Referring to the OS mapping on my phone, I could see that this was private land with no permissive public access. I didn’t feel confident in hopping over and searching for a trig that may well have been removed or damaged. 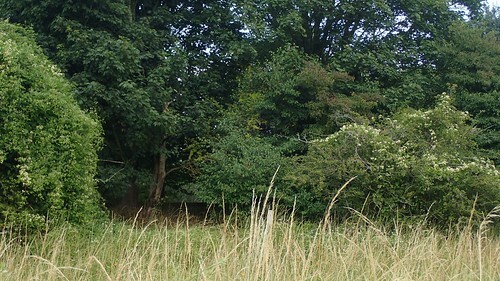 This is also the site of a former Roman Temple. 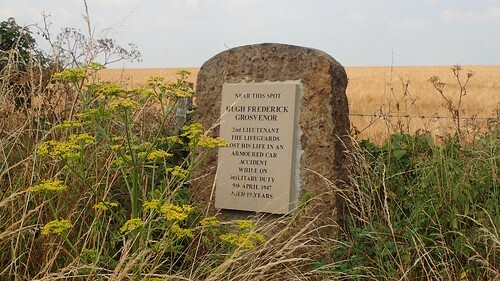 As it happens this trig pillar on Lowbury Hill has been logged by many others and in fact contains a memorial plaque of its own. 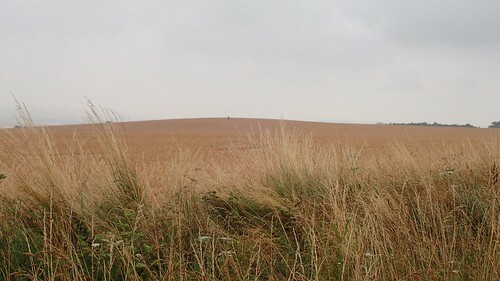 I wonder, how many people have died on or close to The Ridgeway? Will I make it all the way to Ivinghoe Beacon?!? On my return to the trail, I stopped in the shade for my third and final snack break, with only ninety-minutes of walking to go. 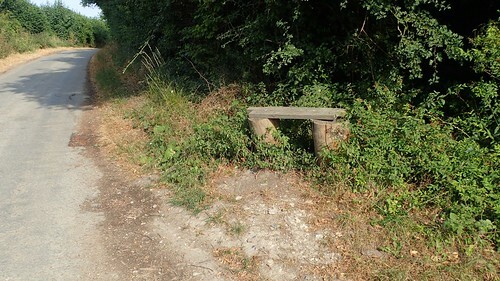 Above Streatley, the familiar track and path transforms in to a tarmac road, with the option of an unconvincing bench to sit on, should you crave a rest at this point. Following the road as it turned and began to descend in to the town, I could admire the views of South Oxfordshire to the north. 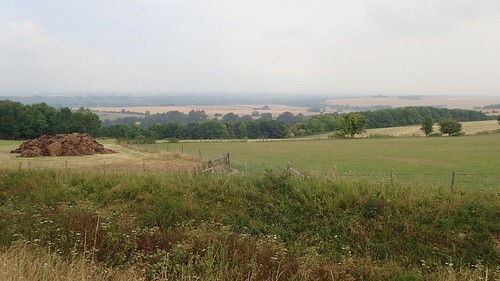 I found this confusing, as I’d begun my day walking in Oxfordshire, had crossed in to West Berkshire and, over the next day, I’d be returning to Oxfordshire once more – in spite of the fact that The Ridgeway runs from west to east! 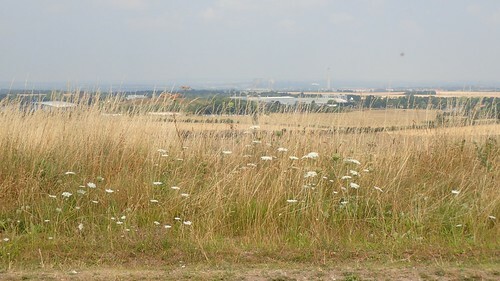 I passed on a final opportunity to bag a trig point on this day, between Lough Down and Lardon Chase. 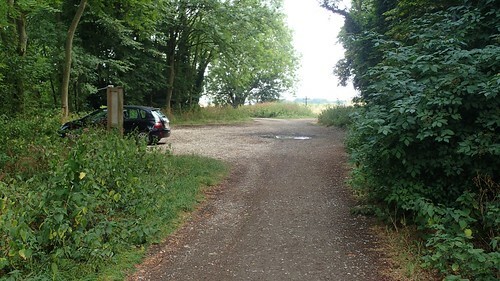 Although it’s open access land, I couldn’t see any suggestion of a footpath leading from the road at any point and neither map would help me. 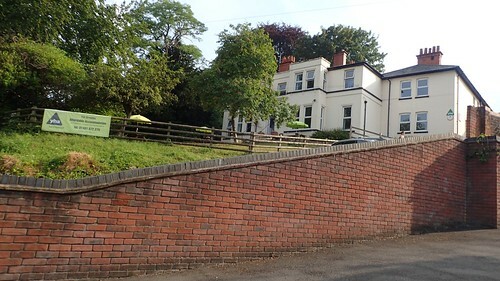 But I was warmly welcomed in to YHA Streatley-on-Thames upon my arrival and the showers were available as soon as I arrived. I’d end up cooking pasta with a stir-in sauce for dinner (all of which I’d carried with me) and shared my six-bed room with three others… None of whom I really talked to or anyone else staying over the weekend! I didn’t spot any other hikers. 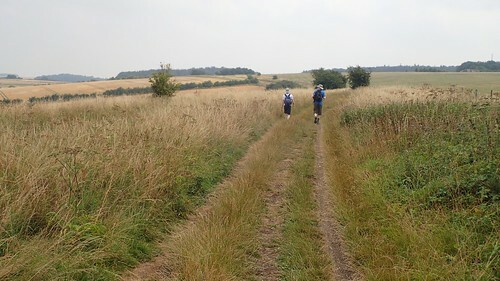 In the morning of Day 3, I’d be walking on to Watlington. 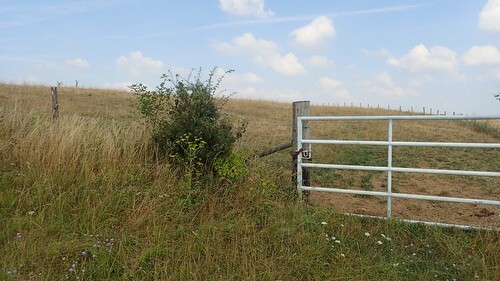 This entry was posted in The Ridgeway and tagged 35:45, accommodation, Airzone Trek+, backpack, Backpacking, Berkshire, bridleway, byway, chalk down, hiking, hillfort, Hugh Frederick Grosvenor, Letcombe Castle, long distance footpath, Lord Wantage Monument, Lowe Alpine, national trail, Oxfordshire, Peter Wren, rucksack, Scutchamer Knob, Segsbury Camp, Sparsholt Firs, Streatley YHA, Streatley-on-Thames, The Compton Hundred, The Ridgeway, trekking, trig pillar, trig point, Uffington, Uffington Castle, Walking, Wallingford, Wantage, water tap, White Horse Hill, youth hostel on 03/08/2018 by Olly Parry-Jones. Thanks for your comprehensive reports. 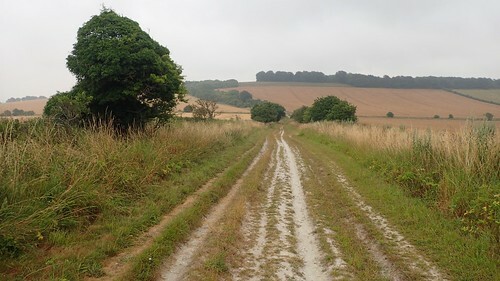 We’re planning to walk the southern half of the Ridgeway in a couple of weeks – over 4 days, not 2! I’ll keep an eye out for some of the things you mention. Thanks for reading and for your comment. Jonathan. Best of luck to you in your trip. It’s a tough route, following the dry tracks for so long. You’ve made a very wise choice to lessen the mileage each day. 😉 I recommend one of the guide books, if you don’t already own one. How have you found it for sourcing accommodation and links to and from each end of the trail? Hi Olly – sorry, took a while to get back to you, didn’t it?! We had a fantastic time. I found the trail itself a lot better than I’d heard about, so that’s good. We found accommodation OK – we used 1 traditional B&B, 2 pub B&Bs, one Airbnb (there were three of us). As for transport, we drove to Goring and took PT to Avebury, walked to our B&B and they gave us a lift to the start of the trail. It’s good to hear from you, Jonathan. No worries at all. For some reason, your comment had landed in my Spam folder as well. I’m pleased to hear that you were impressed with the trail and manage to arrange things accommodation and transport-wise. AirBnb is a great idea! Sounds like your B&B hosts were very kind also. 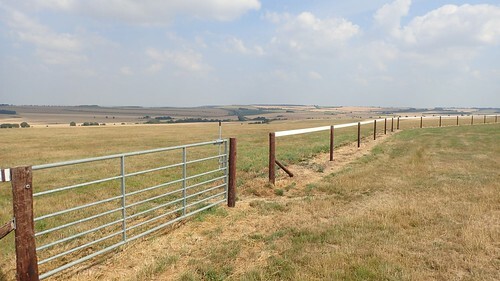 Do you have future plans to walk the other half of The Ridgeway now? Hiya – we actually walked the northern part years ago, but would like to do it again one day! Glad to hear it, Johnathan. It would be interesting to note how and whether the route has changed at all in that time.